1. Wash the beans. Pour the water into a pan, add the beans and bring to the boil. Boil hard for 15 minutes, then reduce the heat, cover the pan and simmer until soft for about 30 minutes. Drain. 2. In a separate pan, par-boil the potatoes in boiling water for 10 minutes and then drain well. 3. Heat the oil in a heavy pan and fry the cumin seeds until they splutter. Add the chilli, garlic and ginger and fry for 3-4 minutes. 4. Add the turmeric, chilli powder, salt and sugar and cook for 2 minutes, stirring to prevent the mixture from sticking to the pan. 5. Add the 4 curry leaves, chopped tomatoes and tomato puree and simmer for about 5 minutes until the sauce thickens. Mix the tomato sauce and the potatoes with the mung beans and heat through. 6. Garnish with the extra curry leaves and serve with plain boiled rice. 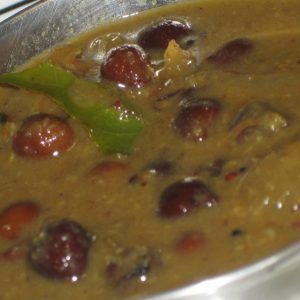 Feel free to comment or share your thoughts on this Mung Beans with Potatoes Recipe from Awesome Cuisine.